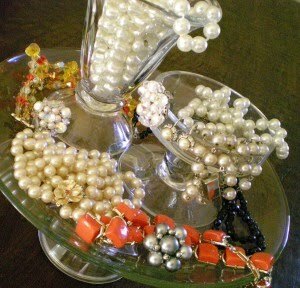 I was lucky enough to score some decants and samples from the already famous Carol’s vintage find. So I decided to give them the attention they deserve. You should all take into account that my knowledge of vinateg stuff is seriously limited so I’m just learning my way here. And what a way that is! I wrote the other day how I finally understand all that love for vintage perfumes going around. Today I’ll talk about two samples I received and I’ll cheat a bit and check what Carol already said about them because it is really hard deciphering notes without anything to go by. I first tried Blue Carnation. The opening almost threw me off my feet. Boozy chocolate with some saffron and cinammon incorporated into a perfume structure. And I just adore cinammon. Unfortunately for all the other notes, after a while I couldn’t smell anything around saffron/cinammon. 🙂 Not that that really bothered me. It’s not like it smells only of cinammon (although it’s quite unmistakeable) but that’s what I could smell most easily and I just couldn’t figure anything else. Now I’ll go see what Carol wrote. I obviously have no idea what carnation smells like. 😀 I can smell something a bit flowery and slightly salty-tinged (is there some iris in this?) around my cinammon /saffron thingy – maybe that’s what carnation smells like? On my second try I kept wondering where did I get that boozy chocolate from the beginning. But I’ll keep hoping it will appear again eventually. Next off is Stepan. That was a bit more complex to figure out than Blue Carnation (not that I managed well). I thought I was smelling rose (lately, whenever I’m not sure at first what it is, I assume it’s rose). It smelled aromatic in a licorice-like way, sweet and sligthly nose-pinchy but not as lavender can do it, more in the way of green, herbal aromatics (you know rosemary type although I don’t think it was that). But it could be an aromatic Mediterranean herb of some kind. It was everything – aromatically oriental and spicy. Like an aromatic rose but not a soft and feminine rose (this smells more masculine), it is easy to smell but slightly prickly. And there is this exuberant fruity feeling hidden somewhere inside. Here is Carol’s take. I will wear this a bit more trying to get more out of it because I can tell there will be more as soon as my nose acclimatizes itself to vintage stuff. I get surprised each time I smell one of them. these sound really interesting! I keep wanting to smell them, but alas, my budget is too stretched at the moment! LBV, I'm not sure I'd recommend smelling good vintage stuff. 😉 It tends to develop into an obsession.